DC put together a couple of great panels this year at Denver Comic Con. They brought out a great crew of writers and artists as well as previews of Flash and the Arkham Knight Video Game. Overall this was a great panel. My only issue I had with this panel was the room they were placed in. For some reason Denver Comic Con gave them a small room and it easily could have filled one of the main ball rooms. It looked like a couple hundred or more people were turned away. I hope Denver Comic Con rectifies this next year. If DC is willing to bring out some of their big guns they deserve a big room. An event that combines all of DC comics, video games, and tv programming is going to bring in a big group of people. A few questions on a lot of people minds is whether some of the old Pre 52 characters could appear after Convergence. The answer from DC seemed to be yes. King went on to describe the build out of the series. How Brainac went through the multiverse and effectively collected cities and characters that now are combined in convergence. I think the result of Convergence could allow DC to keep the new 52 but also bring some of its older characters. I hear a lot from Superman and Oracle fans and my guess is that one way or the other we will eventually see the older version of these characters. Van Jansens promised a Barry Allen / Flash story that would surprise both comic and TV fans of the Flash. In the story of the Flash, Barry Allen's mother is killed and his father Henry Allen is convicted of the crime. Van Jansen teased a dramatic upcoming cover of the Flash that featured Henry Allen (Barry Allen's Father) firing a gun at the Flash. He hinted at the truth of the murder of being revealed. Jurgens revealed his next project is going to be a light hearted one focused on the character of Bat-Mite. Bat-Mite is imp like character that possesses what seems like magical powers but is actually advanced technology from the 5th dimension. Bat-Mite in this story believes he has "fixed" Batman and in Jurgen's words, “Now he’s going to go on to deal with the rest of the DC Universe”. Jurgens promises that Bat-Mite's adventures are going to have very unexpected and humorous results. Palmiotti and Amanda Connor have received massive attention from the Harley Quinn series. One of these things they are attempting to do with Harley is to take her out of Gotham. 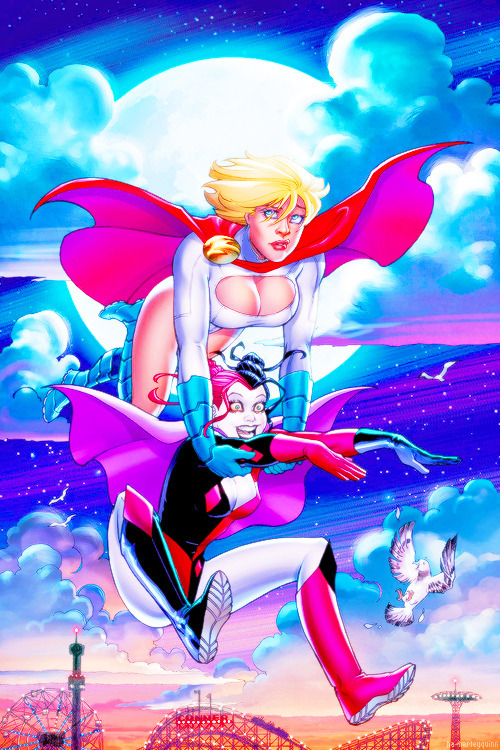 This series teams up Harley with Powergirl as they travel into another dimension. The art from Amanda Connor continue looks amazing I actually bought a print over the art above. They also showed the cover for the 2nd issue of this series which featured Harley ducking/hugging Powergirl as the two were surround by laser guns. Amanda Connor said that Starfire is seeking out a new and hopefully normal life in Keywest where she hopes she won't stick out with her orange skin too much. Palmiotti promised that this would be a great issue for new readers to learn about the character. Marguerite Bennet flat out sold the hell out of her Bombshells project. The crowd seemed extremely enthusiastic over this one. The premise is that in this Bombshells universe the female versions of the characters came before the male versions. This alters the history and the females are main characters in the universe. The art from the series also looks very striking, I am expecting a lot from this one. The crowd also liked the idea of the Madmax tie in books which are various prequel stories that will come out that focus on characters from the Madmax Fury Rode film.